Well I don’t know where spring went but it is gone…Rain, cold, and wind are back here in Northern California. Weather the last week has been brutal after 70 degrees and sunny for a week. Amazing how my mojo and over all demeanor changes when it gets cold and gloomy again…S.A.D. is a real thing I think. Lake Oroville: Lake Oroville just keeps getting better. Even with rain, sun, hail, wind, cold this week we have been getting good numbers of fish and good size. Most of the fish are coming on the Float’n Fly due to the colder water temps, but as water and weather warm we should see some stripped fly fishing start up and maybe even some top water. Valley and foothill bass lakes in general are really turning on across the foothills and Northern California Valley as spots, smallmouth, and largemouth enter into pre spawn and spawn mode. There are many ways to access these fisheries weather it is through a guide, your own boat, float tube/pontoon boat, or even walking the banks. As we are looking at big run off and high flows this is going to be a consistent way to get out and catch some fish. GREAT YEAR TO GET INTO BASS FISHING! High flow 11,420cfs…Getting out of the boat and swinging flies or nymphing from a boat in the Low Flow are your best options. The Low Flow channel is built to take these flows and the river is fishable but there is no crossing the river so hop scotching around in a boat or via car will be necessary if you wish to wade. great time of year to get out and wade fish while swinging flies. Lower Sacramento River Trout fishing has been really good but flows just went from 9500 to 15,000 today so not sure how that will affect fishing. If the river settles at 15000cfs it should be fine. Bouncing and changing flows though can mess the fishing up on the Lower Sac for trout. Lower Sacramento River Striper Fishing for the migratory fish around Colusa should get going here the next week if the flows drop back down. The River was just about to come into shape and the migratory and resident fishing would of turn on and then the flows came up and we have a storm coming in this week. All said though it is going to be a great striper year with all this water!!!! Migratory fish are moving up river RIGHT NOW WITH ALL THIS WATER!!!! Lower Yuba River has blown out again back up to 10,500cfs…the Lower Yuba will not be safe to float until it drops back down around 3000cfs…which unfortunately I think is going to take a while. 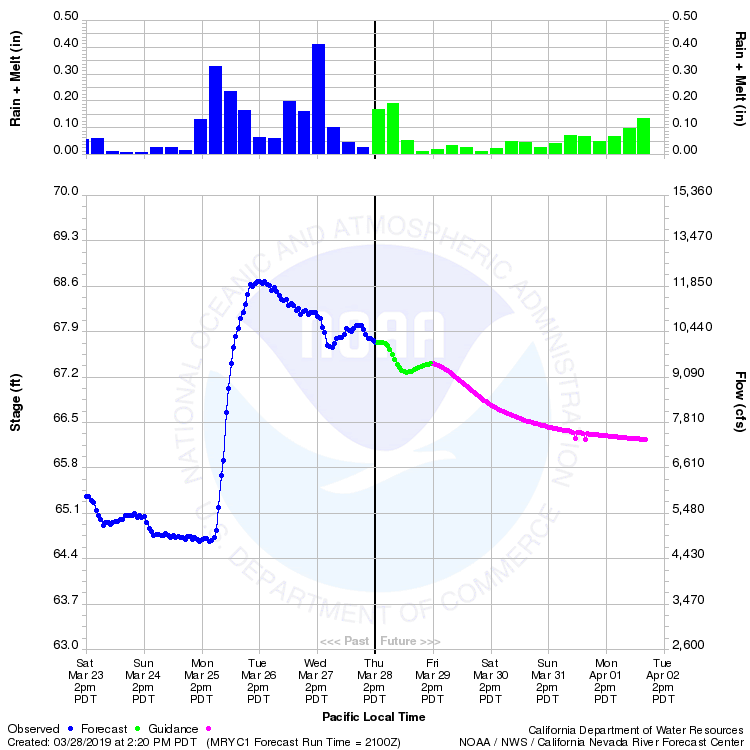 Projections out of Marysville on the Lower Yuba River…Going to be a while.